Classic Collection: Merry Merry! [W6876] - $6.50 : Yarn Tree, Your wholesale source for cross stitch supplies. 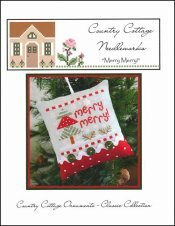 Shopping Cart Home :: Cross Stitch PATTERNS :: Country Cottage Needleworks :: All Country Cottage Needleworks :: Classic Collection: Merry Merry! Chart ten of twelve in the Classic Collection Ornament series by Country Cottage Needleworks. Snowflakes are falling around the decorated pine tree and the branches that have fallen on the snow covered ground. Stitch count 57w x 45h.